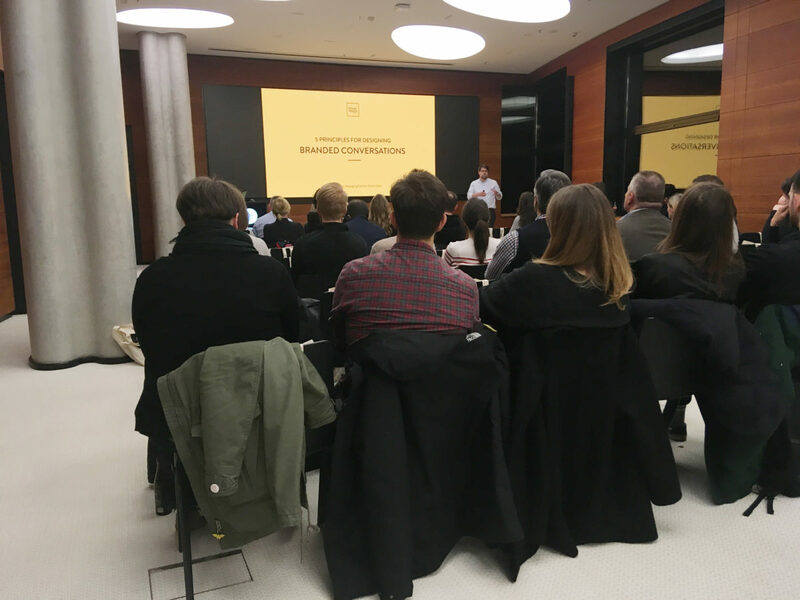 We had a blast at our Conversational Experience Meetup in Berlin yesterday! Networking, meeting new people, gathering fresh and innovative ideas and perspectives. While website-based online commerce and customer service have reached their limits, Conversational Commerce opens up entirely new, more human-centric opportunities for businesses. Getting ready for the conversational era has therefore become a priority for leading companies and brands worldwide. Chatbots and voice assistants continue to gain momentum. Michael Bommer leads LivePerson’s European team as SVP EMEA and was the first speaker. With more than 25 years of experience, he advises some of the largest global enterprise companies on how to best leverage technology and AI to achieve a superior customer experience. As co-founder of relayr and Next Big Thing AG, Michael is a vocal part of Berlins start-up community, advocating for the opportunities of digital transformation in all industries. Over the last 12 months, leading telcos began servicing customers through WhatsApp, enterprise brands have enabled conversations directly in their Google display ads, and retailers are selling products through Apple Business Chat and completing transactions through Apple Pay. Every aspect of the customer journey is now conversational. Michael made some great provocative and thought-enticing points on how call centres are a thing of the past and that the future of customer service is deeply intertwined with messaging. 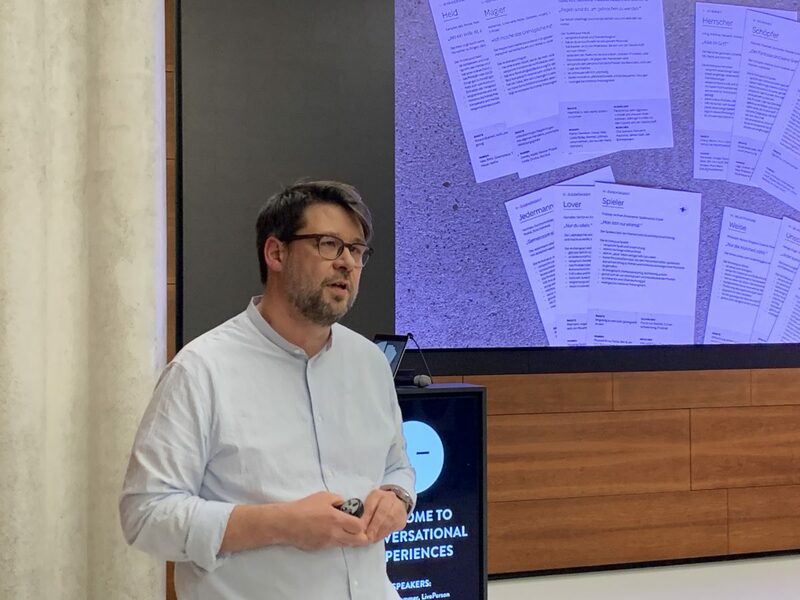 Our very own Marco Spies then elaborated on the key aspects of what needs to be considered when designing a chatbot or voice assistant as they are increasingly part of the digital offering of brands. In particular he delved into the importance of a good match between bot personality and brand personality for the sake of differentiability, usability and brand recognition. To drive the point home, he spun an arch from the 80s TV series ‚Knight Rider‘ to Audis vision of their car voice assistant for the 2020s. Ultimately Melanie Longdon of Liberty Global – the world’s largest international TV and broadband company – rolled out message-based customer support with bot to human handoff in early 2018 and told tales of satisfied customers and grateful support agents. For her the switch from call centres to messaging channels meant a tremendous leap ahead, which she underlined with impressive figures and statistics. Thus, our short evening about conversational design became an evening of conversations on designing the future of conversing with customers in e-commerce situations! For us the meetup was a resounding success and we absolutely intend on returning to the stage for future meetups, seminars and workshops, so keep your ears open!